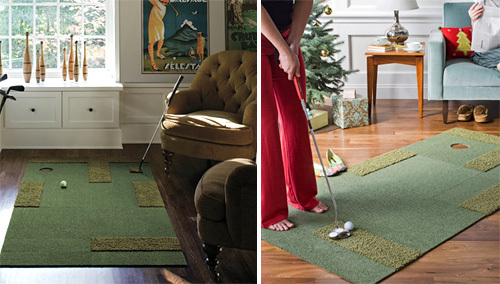 Putt Up Or Shut Up Rug Kit Turns Your Living Room Into A Miniature Golf Course | OhGizmo! Ok, forget what I said the other day about the virtues of practicing your putting on a real green. That was before I learned about the Putt Up or Shut Up Rug Kit that uses a combination of different carpet types to create a miniature golf course in your living room. Each rug is composed of 8 modular tiles that can be combined to create different putting challenges ranging from a par 3 configuration up to a par 5. A 3-foot by 6-foot tile area will set you back just $139.99, and if you’re like me and blow tens of thousands of dollars on mini golf every year, having this installed wall-to-wall is a far more economical solution.